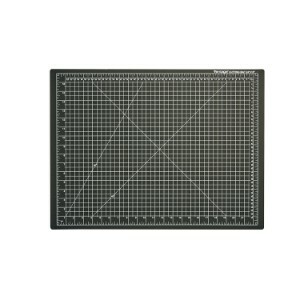 A quilting cutting mat is one of the most important of quilting supplies you will ever buy, as it can or break it when it comes to the accuracy of your cuts. And of course, accurate cuts are crucial to make your project exactly how you want it to be. However, there’s a plethora of cutting mats on the market, and they vary greatly in quality, durability, the stickiness and even the price, among other factors. If you don’t want to go with any random product here trying your luck, you would want to pick on the products we have reviewed below, as they really are the best cutting mats out there for quilting projects. The Nicapa cutting mat is an all-round quilting mat that would serve you well no matter the kind of quilting project you’re working on. While it’s much cheaper than some of the more premium brands like Silhouette, it performs much better than them and even manages to get around some of the most common and annoying issues quilters typically encounter with cutting mats. It’s not a large cutting mat as it’s just 12×12 in size, but unless you’re working on something that requires a very large mat area, you will be pleased with how portable it is. However, the best thing about this mat is that it’s very sticky and would hold the sewing fabric in place extremely well, but it would also peel off like a breeze. This is something very important to consider, as it takes a lot of challenge out of your quilting project. However, the majority of cutting mats – including some of the most expensive cutting mats for quilting – tend to tear your paper material when peeling if off. The Nicapa cutting is also considerably thicker than most quilting cutting mats, so it should last you much longer than them, especially the ones in this price range. Its price is actually something we are very impressed with, as even the cutting mats that cost twice as much as the Nicapa cutting mat or even more aren’t as good as it in terms of the durability or the glue quality. A couple other impressive features worth a mention are its clarity and the lack of any annoying smell. 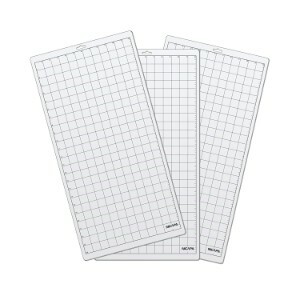 This cutting mat is clear enough to let you see through it so that you’re always on top of the cutting process, and can see the cut clearly. Why We Like This Product? We really like the fact that it offers the best of everything at a surprisingly cheap price. Also, besides a quilting sewing machine, it would work pretty well for you regardless of whether you’re cutting something to be used with a mechanical sewing machine or even an overlocker sewing machine. The Alvin cutting mat is going to turn out to be the best self-healing cutting mat for most sewers or quilters. If you don’t already know, a self-healing cutting mat is different in the sense that it closes itself up if you use a blade on it that’s too sharp and ends up making cut marks on it. This makes it much more durable than the general mats. Apart from that, however, it also holds the quilting fabric in place in a much better way, and usually also offers a much smoother and accurate cutting experience. And you can expect the Alvin cutting mat to have all these features, besides its extraordinary durability. You can use the sharpest of blades on it, and you still wouldn’t see any kind of marks on it, even with a magnifying glass. What’s more, it allows you to use both its side as a cutting mat, and given the kind of durability each of them brings to the table, we think it might as well last forever. 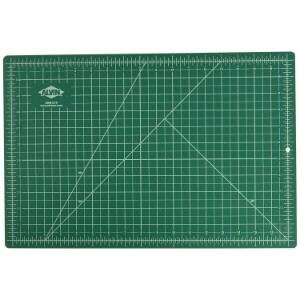 The Alvin cutting mat is available in many different sizes, and its standard 12” x 18” size would be ideal for most quilters no matter the type of sewing essentials they are using. It’s also an all-purpose mat, so ranging from adding zipper to smocking to sewing a seam, there’s no type of sewing project you wouldn’t be able to cut fabrics for using this mat. It’s also one of the few cutting mats that come with a hanging hole, paving the way for convenient storage. It’s thickness of 3mm also translates to a very high level of durability for you, as we just discussed above. But these aren’t major issues. Sure, if you receive the mat in a warped state you can always return it, but it isn’t very common. The inch and half inch lines looking the same can make things a bit more time-consuming, but unless you’re using the largest size it’s not going to be much of an issue either. However, you would be hard-pressed to find the kind of durability the Alvin self-healing mat offers, apart from the fact that it doesn’t smell, can take a lot of abuse without showing any marks or scratches and offers a lot of stability when working on the fabric while protecting your table. It can work just as well as a cutting mat for sewing as it does as a quilting mat, thanks to being very flexible. Here’s one of the most popular cutting mats on the market. It’s made using rubber, and works particularly well with Cricut products, although it also works pretty well with pretty much everything that has to do with cutting any kind of material. If you’re a beginner using a cutting mat for the first time, however, we would recommend you to go through our sewing help guide here before starting to use it. We talk about buying the right type of fabrics there which would go a long way in getting the most out of your project as a beginner. Coming back to the Cricut cutting mat, let us tell you that you will have to care for it a bit if you want it to last really long. 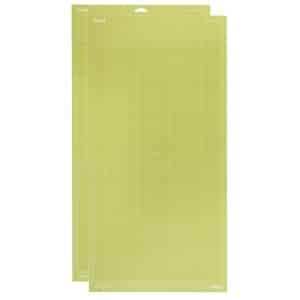 You must always use the clear film cover when storing the mat, or else it would attract paper scrap and dust. Also note that this mat would work great for medium weight fabrics, but it isn’t designed to work as well on very thick or heavy fabrics. If you use the right type of fabric though, you will find the cutting very convenient as this mat keeps the fabric in place in a way that helps prevent accuracy issues. It’s also a much more durable option than the considerably more expensive Silhouette mats, but as we said, you just need to care a bit to lengthen its life. Also, try to avoid using very sharp quilting rotary cutters as they can cause irreparable damage to the mat’s adhesive, making it difficult to peel off a project without damaging it in any way. The Cricut Grip Mat is durable, helps get very accurate results, and makes the cutting process a lot easier if you know how to use it the right way. So we have another Nicapa cutting mat on the list. However, this one’s significantly cheaper than the first one we reviewed above, but the trade-off is that it can be a bit too sticky for lightweight fabrics that are more prone to tearing. But unless you’re using very lightweight fabrics or don’t mind being a bit more careful when peeling off the project, there’s nothing to not like about this Nicapa cutting mat. It doesn’t feel flimsy at all like many other mats in this price range. If you’re a bit careful with the way you use it, it should outlast a Silhouette easily, and that’s saying something, given the steep price difference. Another feature of this Nicapa mat you would really love is that it offers extremely consistent cuts. It doesn’t let the paper or fabric move at all when you’re cutting through it, which would really help you in getting perfectly accurate results. Similarly, unlike when using other cheaper cutting mats, you won’t have to keep turning this one over in order to minimize the curling as you use it. It doesn’t let the fabric curl even when peeling it off, which is a great plus. This product is very cheap for the kind of quality and durability it brings to the table. It’s also a much more complete option, as regardless of whether you’re making pre-cut quilt squares for your future projects or custom quilting fabric assortments, it’s going to work just as well. First things first, perhaps the most unique thing about the Dahle self-healing cutting mat is that even when it gets curled or bent, it flattens out in like less than half an hour if you put some weight on it. This can be a much bigger problem to deal with when using other mats though, as we discussed above. As far as the self-healing ability of the mat is concerned, if you don’t mind replacing the blade when it goes dull, you should see no heavy cuts even after regular use over a considerable period of time. The material used to make this mat is high-quality as well, so you can expect it to last much longer. You would get just as accurate results with the Dahle as with any other high-end cutting mat, but with the added advantage of the Dahle being a self-healing mat. The Dahle mat also comes with markings that are fairly bright, making it easier to read and avoid accuracy issues. The mat is also very smooth, and the cuts are a breeze to make on it. Finally, it does come with a smell but if you air it out for a day, the smell would go away for good. No matter the type of fabric you’re using or the kind of cut you need to make depending on the type of sewing machine you use, the Dahle mat wouldn’t have a problem honoring any kind of requirements. It’s a much better alternative to some of the much more expensive products like the Olfa cutting mat; it’s versatile enough to work well as a rotary cutting mat or a rotary mat, a sewing cutting mat as users have been using it for sewing projects and they are very pleased with it, or a quilting cutting board (if you go with the larger sizes). It being smooth on both the sides would also allow you to rotate it very easily when using it, making it a great rotating cutting mat as well. How We Chose the Top Cutting Mat in Our List? The quality is the most important factor we consider, as cutting mats are very prone to damage due to being frequently subjected to sharp cuts. So we consider whether a particular product would be able to hold up well over time. We also pay special attention to the quality of the adhesive of the mat; whether it lets you easily peel off the project or causes any kind of tearing, especially when using thinner fabrics. The cutting accuracy is something just as important for us, and we only recommend products that can hold the fabric in a stable way when you’re cutting through it. We are also careful about the smell. While we don’t mind a product that smells initially but can easily be aired out to get rid of the smell, we are wary of anything that would refuse to give up on its smell. We take the price very seriously as well. As the price range is quite large, it’s important to look for something that helps you get the most bang for your buck, and the products above do let you do that. Finally, we understand that the fabric you’re cutting may be treated in many different ways depending on what you’re trying to do, such as flexible foam interfacing, sew straight lines, sew a slip stitch, make a zigzag stitch, add elastic or use it for an embroidery project. We understand these may all call for different types of cuts, so we also make sure that the products we recommend would work just as well no matter the type of cuts you’re looking to make. There are primarily two types of cutting mats: Self-healing mats and plastic or the general cutting mats. As you probably already know now, the former is better in the way that any scratches or cuts developed in them due to being exposed to the blade’s cuts are reclosed automatically. However, the plastic or general cutting mats will show the cuts, and over time may not work as well as a self-healing mat. Then there are also some mats that are better for some specific applications than the others. However, we recommend the most complete products on the market, which will not only be suitable for the more unique fabrics like upholstery fabric and faux leather, but also for muslin, broadcloth and cotton, home decor, canvas and duck and more. So no matter whether you landed on this buying guide when searching for rotating cutting mat reviews, a fabric cutting mat, a large cutting mat for sewing, a rotary cutting mat or just the best cutting mat, the information and reviewed products on this list would be perfectly relevant for your needs. Imagine you’re in your sewing room, sitting on your sewing chair, working on your Juki sewing machine which is also a great sewing machine for quilting, with the batik quilting fabric or any other quilting fabric placed on your sewing desk. The crafting room speaker is playing a video where a quilting expert is guiding you through a quilting technique you aren’t very familiar with, and the air purifier in your room is making you feel comfortable when following the instructions. However, you’re now instructed to cut the quilting fabric using a fabric cutting board or one of the rotary cutting mats and quilting rotary cutter blades. But the rotary cutting mats you have don’t live up to your expectations. They fail to hold the fabric properly as you cut it, leading to the cut not being accurate enough. And despite all the effort you put into setting up a great sewing or quilting environment, you end up a disappointed quilter. And that’s precisely why you need the best rotating cutting mat for quilting, or a large rotary cutting mat if you tend to work with very large pieces of fabric. The quilt cutting mat should also work just as well as a sewing mat. In other words, it must be an all-round fabric cutter board that can get the job done every single time, even when working on something that’s a combination of a quilting and sewing project. TeachYouToSew.com is a participant in the Amazon Services LLC Associates Program, an affiliate advertising program designed to provide a means for sites to earn advertising fees by advertising and linking to Amazon.com.